One of the most important ways to improve your taxidermy is via a taxidermy critique and to be able to self-critique your own work as you are working on it is the key to improving. This is the main basis of producing a good piece of taxidermy and one of the main focuses in my Book on small mammal taxidermy. Since I started running my taxidermy training courses and published my Book, Beginner Taxidermy Small Mammal, many students have sent me photographs of their first attempts. It is great to see their enthusiasm and excitement in their new-found hobby and I do like to see the pieces of work they have created. It is satisfying to feel I helped someone who, like me, started out in taxidermy with great enthusiasm. The very first squirrel I attempted didn’t get past the skinning stage and many subsequent squirrels looked a lot worse than the photographs sent by Tim below. I tried to cover on page 152 of my Book the common errors that students make when they first start and explain how to fix these. 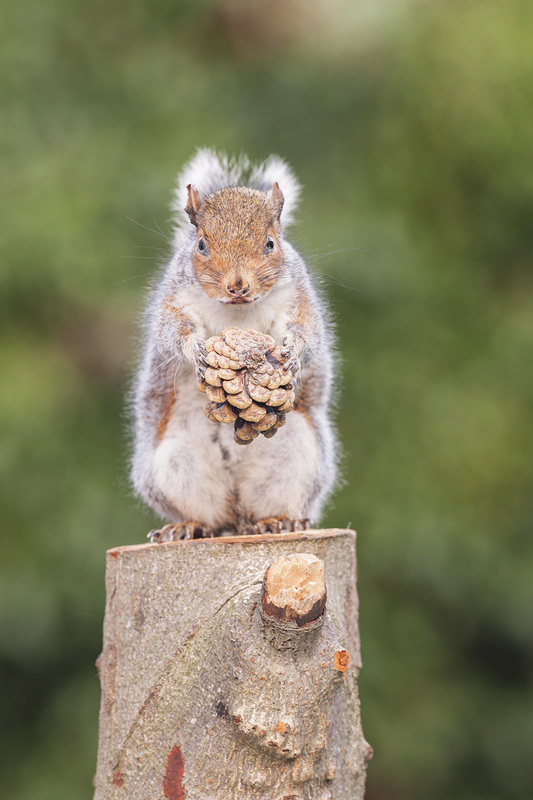 I had been working on a section about self-critiquing for my next book on birds and Tim who had bought one of my Books sent photographs of his first squirrel. These struck me as being s pretty much what I had just written about in my ‘how to get a critique’ section. Tim had taken good photos square on and from all angles with close ups of the head. It was obvious he had read the Book and I thought it was a good opportunity to run through some of the errors and try and help explain how to make better looking animals for students. The first photograph shows that Tim has done exactly what I asked and has taken on board the understanding of trying to look at squirrels in profile. We have a lovely crisp image of his squirrel in a side-on profile. This is great as it helps you to aline your squirrel with life like photographic references at the back of the Book. This allows me a really good opportunity to give some constructive feedback on the quality and a more accurate de-bug/critique. Hopefully this should be of use to other students who may be falling foul of similar errors and misunderstandings. With any Taxidermy Critique I think it’s important to try and explain to a student what they have got right and make them appreciate just how far they have come from their starting point of ground zero. I can see from Tim’s photos that a considerable number of items have been taken on board very well and is impressive for someone’s first effort. Skin The skin and fur look clean and well groomed. Body The shape of the body that has been made (bind-up) and put into the squirrel is very good for a first attempt. Front Legs The quantity of binding on the front legs is good. The transition onto the wrist also looks good (see page 155) although the wrist on its left side needed re-positioning to remove the small wrinkle. The skin placement on the elbow is also good – notice you cannot see any white fur on the elbow as if you could see it, it would indicate the skin had been twisted. The ginger line on the top of the arm has a good natural line and is not twisted. Placement of the leg is nice and close to the bottom jaw as per page 16. Back Legs It is difficult to tell from the photos but I think the back legs lack the same accuracy of binding as the front legs (work through the back leg section on page 125 of the Book again). The feet and the toenail placement of the feet are good. Tail It does not look like there are any twists in the tail but I understand from Tim’s email the tip of the tail did come off while inserting a wire. This can happen if you have a bit of sawdust down the tail and have pushed the wire too hard through to the end. If you find there is some obstruction at the end of the tail, I have managed to move it by injecting water/alcohol in the tip of the tail which should flush the obstruction further down the tail to a point allowing you to get the wire past it. Head The basic silhouette shape of the head is very good for a first attempt and I can tell a lot of effort went into trying to create a good profile in this area. 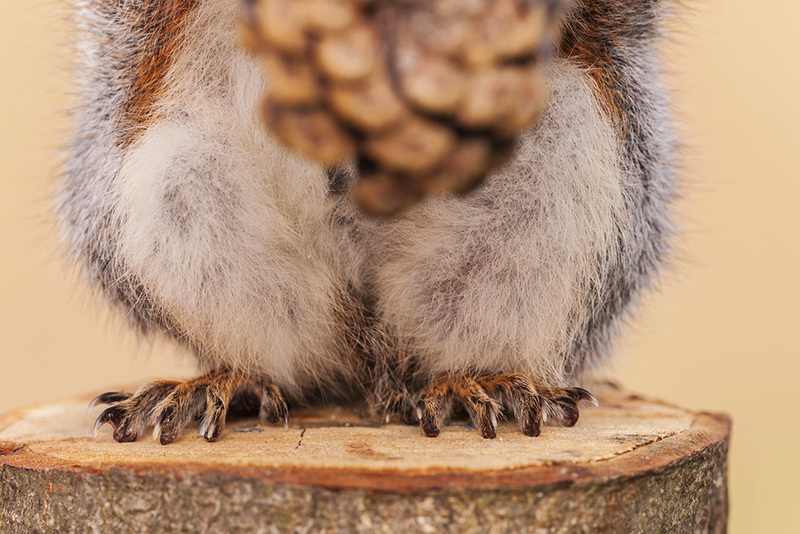 Now you’ve had your congratulations and they are very well deserved but it is time to see what we can do to help you improve your next squirrel. Back Legs Look at page 126 in the Book which walk through setting of the back legs. Compare the angle of the leg bones to those of the squirrel skeleton reference photos in the back of the Book (page 172) where you will see that the alignment of the bones is considerably out causing the whole back end of the animal to look unnatural. The remedy for this while it’s supple is to go through the positioning sequence on page 126 again making sure you position the bones and the desired angles. The position that the legs were anchored could be slightly low. The main problem I see with the legs is the shape of the muscle – again check this as described from page 121. Body The advantage of using a bind-up body is that hopefully by working through the sequence as mentioned n the Book, you can push and shape the legs and force them into the right place (check your references). This should produce a better silhouette for the back end of your squirrel. The body of this squirrel (the manikin) has very few errors. 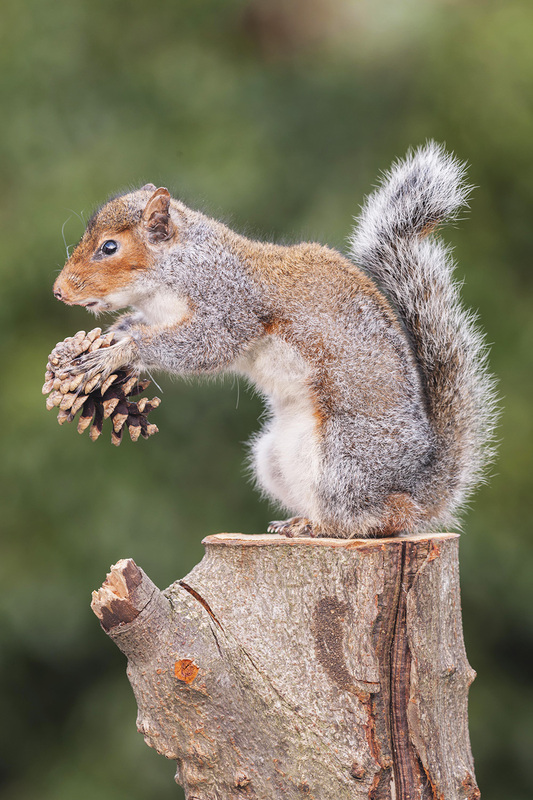 If you look at the profile of that compared to the photograph references at the back of the Book, the hump in the back and shape of this squirrel is good. If your manikin is not looking as good as these photograph references, stop and re-make it to fit the silhouette’s shape and do not assemble until the manikin looks good ie has it got a good outline. Remember, you can work on these manikins spasmodically on an evening after work or any spare time. I know you can get tired when working on a project for a while and frustration can set in towards the end so that you feel like screaming and throwing the thing across the room. This is quite normal behavior for a taxidermist and in my early days with no books to help, I sentenced many a poor animal to flying without wings. You can put the whole squirrel in the freezer and take a day off or even continue the following weekend. 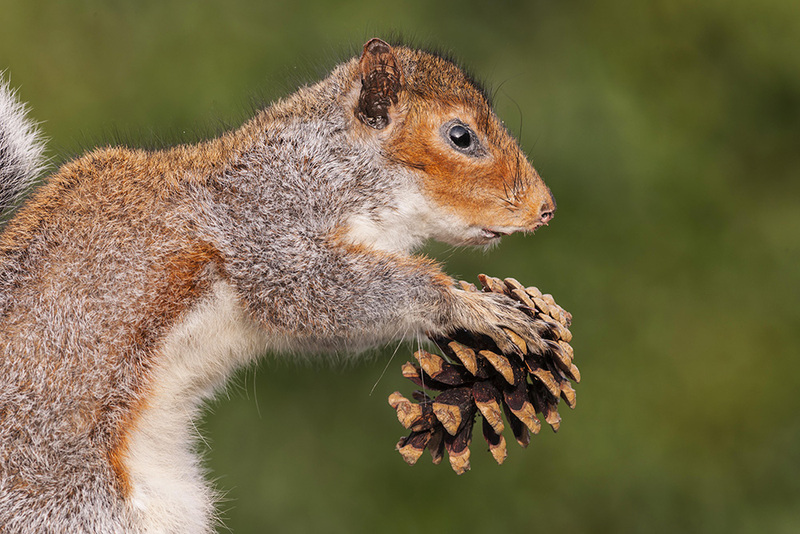 Looking at the front-on photograph of this squirrel, I am impressed how accurately the balance is as the measurements across the shoulders, knees, ears, head and fee apart distance all look good. There is little to critique at this beginner level from this angle. 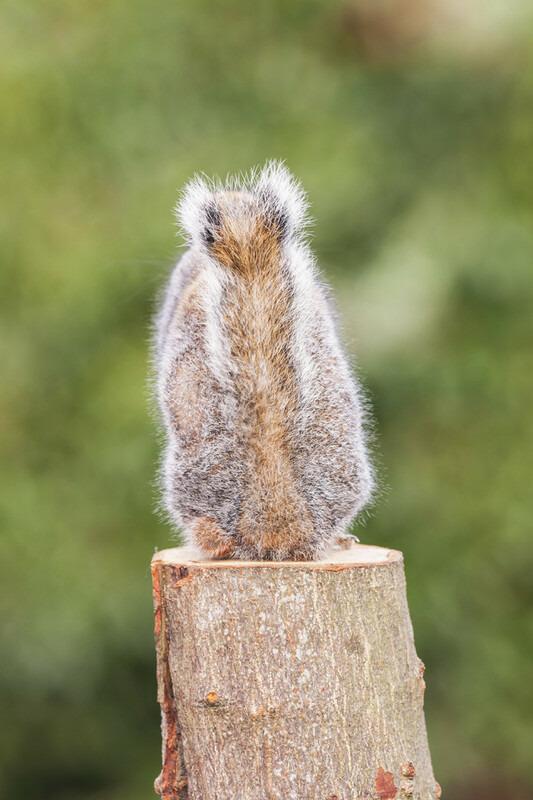 However looking at the back of this squirrel, it is slightly leaning off to one side. I can see a little bit of the ankle that I would not see on a live squirrel. To fix this, it is down to the positioning of the buttock over the ankle – page 122 discusses how to position the back legs. The head can be a little daunting and takes an incredible amount of effort to produce a realistic mount even for a seasoned professional taxidermist with many years’ experience. 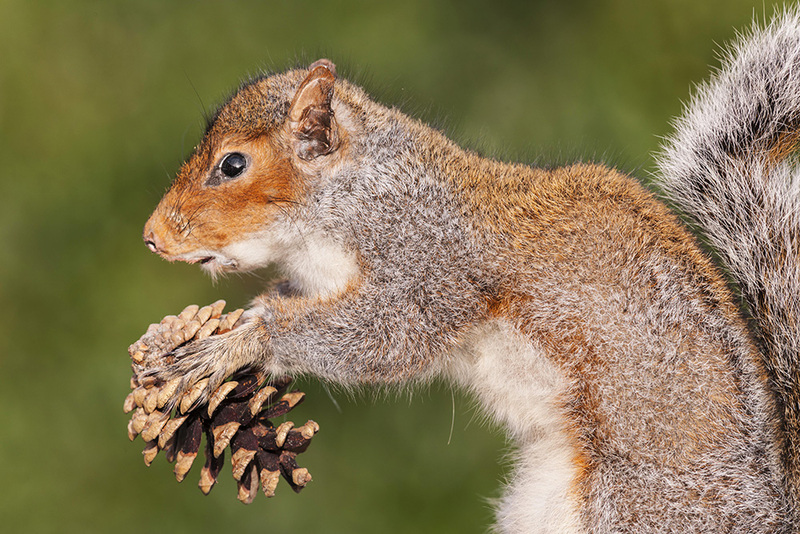 The most obvious point I see on this squirrel is the straightness on the top of the head from the nose going back to the ears. The photograph reference at the back of the Book shows the profile of the head as having a nice curve which gives the squirrel a pretty look and takes away the harshness of its facial features. One of the reasons the section of the profile might look straight is a build-up of clay above the skull. Go back to day one on page 60 and study the shape of the skull and when you come to fit the skin on the skull, try and make sure the skin is tight up against the skull in the places it was when you took the skin off. 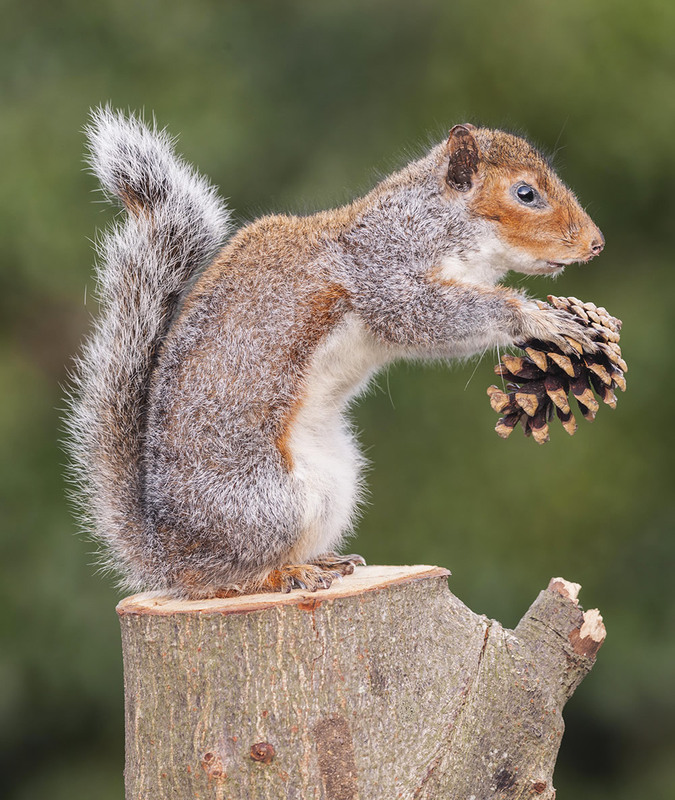 By doing this you will get a much more realistic profile on your squirrel – see page 156 in the doctors surgery section which also points out why we have this gap between the skin and the actual glass of the eye of the squirrel and how to fix. You may notice that the binding looks like it has stopped a little early to create the illusion of the shoulder blade. I might be wrong but I feel it has just stopped a little suddenly and could do with just a few millimetres of extra binding after the end of the humerus bone (see page 100). The skin around the eye looks unnatural which I think is due to possibly not understanding the principle of creating the pockets of skin above and below the eyelid (see day one on page 54). 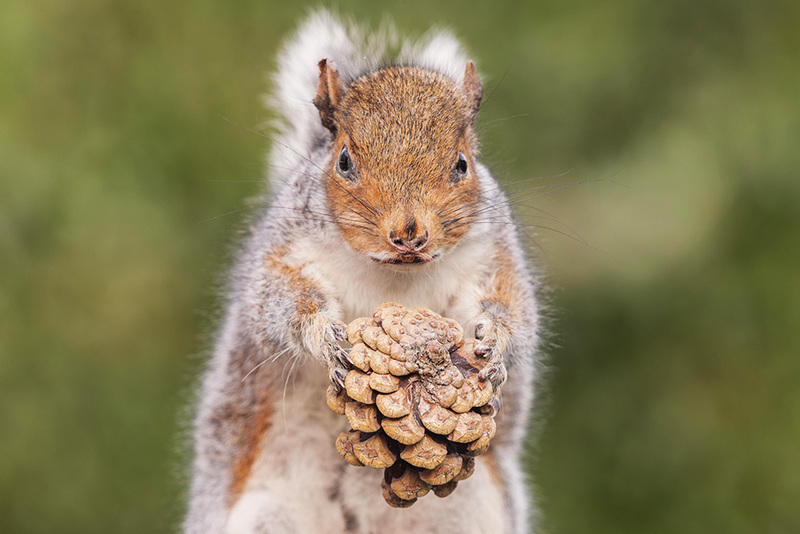 I think after you have done your first squirrel you realise how important these are and take greater care on your subsequent squirrels. Also try shaping around the eyes with a cut (just cut a quarter of the tip of a stiff paintbrush – I found a hog bristle brush work well for this (see page 134). Similar principles apply to the mouth and there are problems with this squirrel but the overall shape is certainly good for a first attempt. I think there is little I can add apart from just work your way through pages 136+ and let me know if I have missed anything. Pretty good balance but lips have shrunk as covered above. I hope this Taxidermy Critique helps everybody and I would like to congratulate Tim on his first squirrel. It is a good piece of work. Keep going. The first item I did is now sadly long gone and I would love to have that to show people. 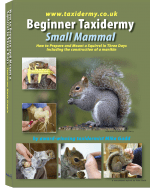 My Book Beginner Small Mammal Taxidermy is available here. PS. Please feel free to leave a comment on this Taxidermy Critique below. Mike I would like to talk to you about something. can you email me?